Red Dashed Area: Snow may continue to fall for a longer period, but may have a difficult time accumulating once surface temperatures climb slightly above freezing Thursday morning, aside from colder non-paved surfaces. Disco: Low pressure is currently tracking just to the N of the Great Lakes. It will transfer to the coast and bomb out for coastal New England. Much of immediate coastal New England is expecting lower accumulations due to onshore flow influence. Interior New England however, especially the Catskills through VT, should expect a nice winter storm from this. 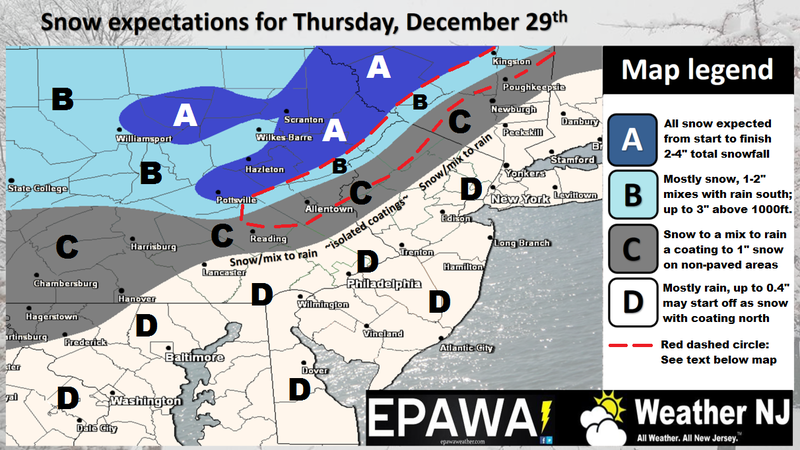 Only the elevations of NWNJ have a chance for accumulations Jersey-wise. The lower 2/3 of New Jersey will battle a warmer surface due to SE flow off the 40+ degree ocean. The mid-levels of the troposphere however are cold enough to support snowfall down into the Newark Basin. Therefore we could have a lot of snow falling for NNJ and maybe even parts of CNJ but not sticking. I doubt non-accumulating snowfall would come SE of the I-95 corridor though. Those along 95 and SE from there should expect a cold rain. Again, the NWNJ elevations have the best chance for light accumulations from this event.